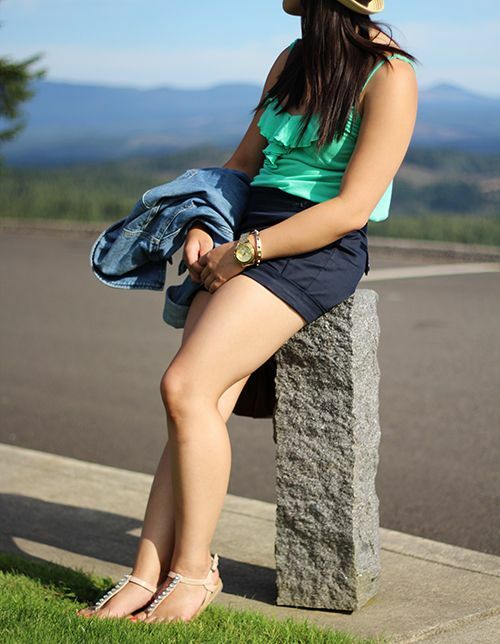 Back in August, I spent the last two weeks with my family road-tripping around Seattle and the Oregon Coast. 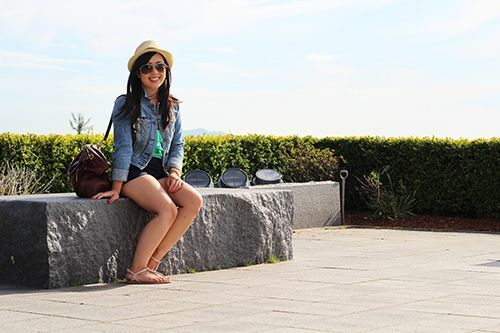 The trip was laid back, we were blessed with amazing weather, and it was seriously such a fun trip. 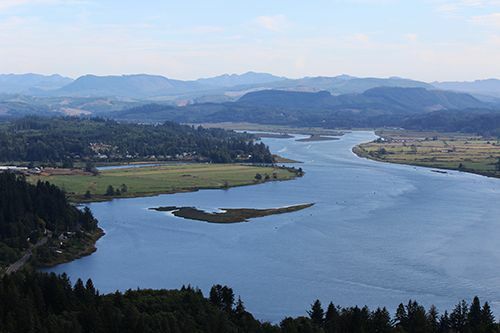 Astoria was our first stop in Oregon, and it's a little town located along the Columbia River. The core of the city has so many well preserved historical buildings, it feels like you've been transported back in time. We actually chose this town as a stop since I wanted to spend time digging razor clams on Sunset Beach - unfortunately the season was closed! We still did get to take in the sights and even caught two crabs on the beach! And yes, they were delicious. 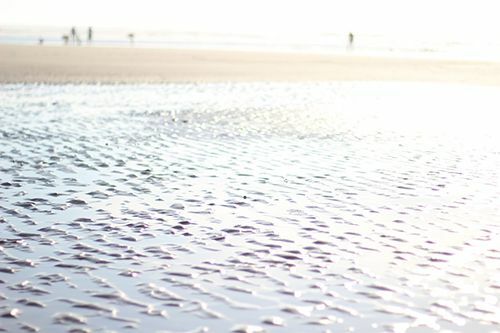 I eventually got to dig my share of clams down in the town of Tillamook, and got to eat some freshly shucked oysters along the coast. 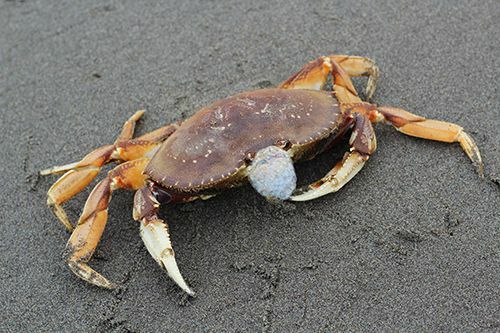 If you love seafood, I highly recommend the drive along the Oregon Coast - feel free to ask for recommendations! 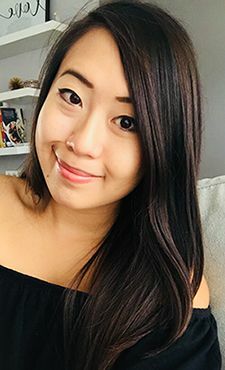 With fall coming at us at full speed, it wouldn't be a proper summer if I didn't have the chance to wear a tube top! I picked up this cute little piece from Forever 21 months back, waiting for the perfect warm day to pull it out of the closet. 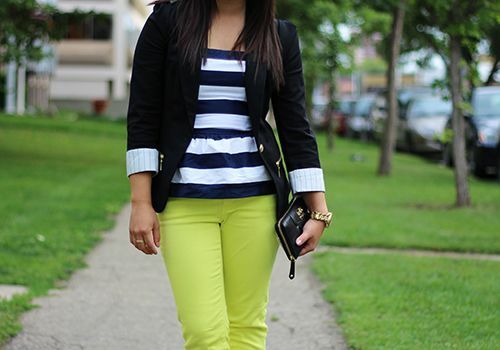 It's structured and has a cute little peplum hem to it, making it stand out from the rest. 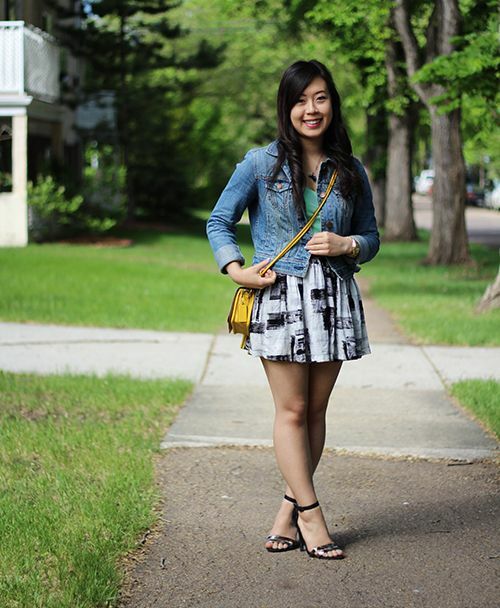 As the colder weather draws near, I'm trying to wear as many summer pieces as I can - stay tuned for the rest! 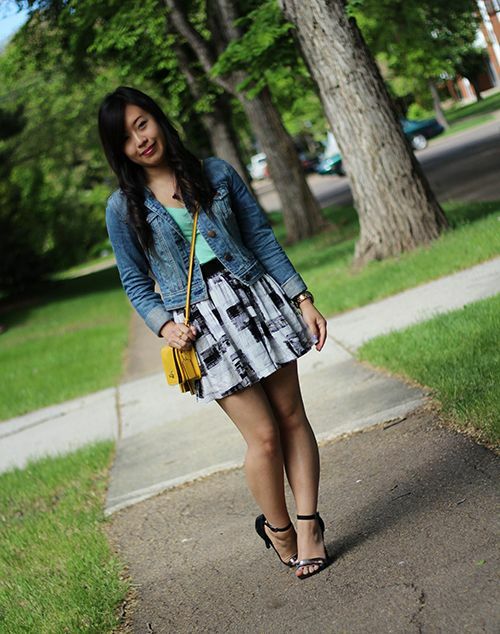 Also - if you happen to live in Edmonton, the Last Call YEG sale is happening on October 5! There will be lots of clothing and accessories for cheap - for details, check the event page here. Monday Funday! Okay, who are we kidding, that really doesn't sound great. But today is my Monday funday and no one is taking it away from me, cause I had weekend no-fun-days, being stressed out with work and writing a paper. Today I am doing absolutely nothing and relaxing at home. Whoop whoop. 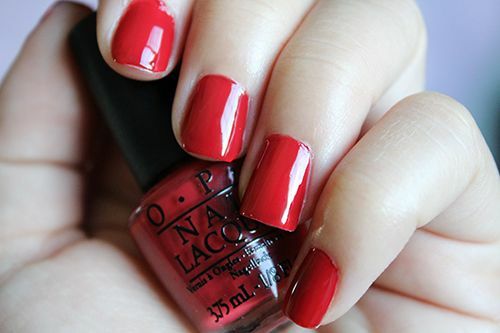 For this weekès edition of Mani Monday, I've got a warm red hue from the OPI San Francisco collection for fall called First Date at the Golden Gate. 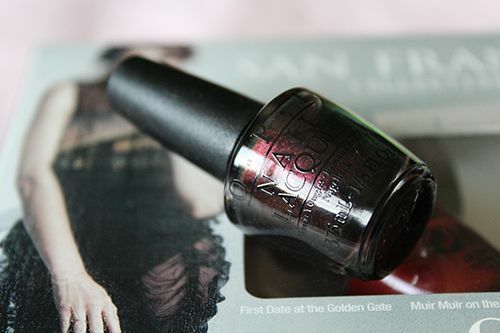 The polish has a super cute name, and the colour definitely reflects the rusty red hue of the famous bridge itself. This shade has warm undertones, making it easy to wear with every skintone, and the best thing? It actually is a one-coater polish! But in the pictures above I did two, out of habit. The formula is incredibly smooth and easy to apply, it's self leveling and wears chip free for up to 4 days! So if you don't happen to have a first date out in San Francisco, at least you can carry this shade with you on a date or two ;). Happy Monday! It's the start of a new week, and the weather in my city has been absolutely gorgeous over the last few days - I have no complaints. Except maybe about all the buzz going around the Miss America selection. Seriously, some people need to stop with the racism and grow up. That is all I have to say. 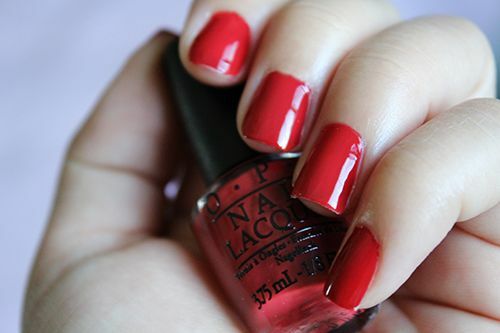 Peace & Love & OPI. Why can't we just all get along and have beautiful manicures? If only. 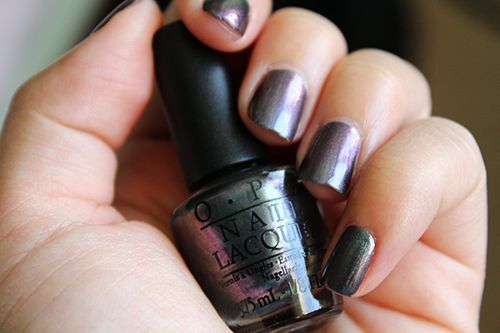 This gorgeous duochrome shade is from the current OPI San Francisco collection, and I couldn't stop playing around with my nails this week, changing the angles and watching the colours change. Thinking about it now, I probably looked like a crazy person, moving my hands around and staring at my nails. Polish fanatic problems. 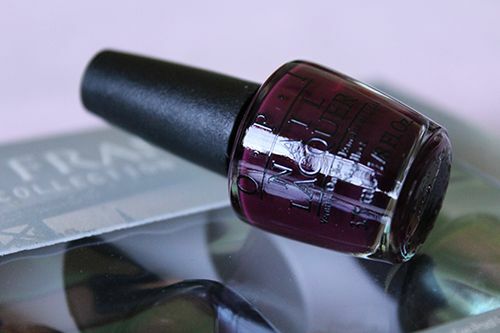 This fine shimmer polish shifts from evergreen to eggplant purple, with a bit of steel blue inbetween, and is pigmented enough to only need 2 coats for smooth, level application. 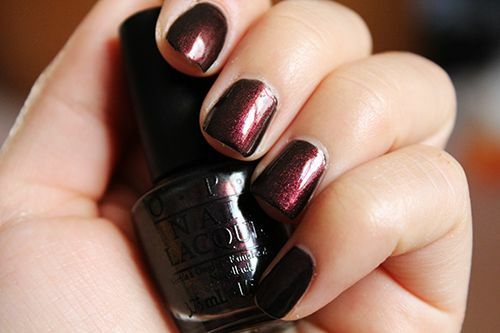 I had great chip-free wear on my nails for up to 4 days, and definitely see myself coming back to this great shade for Fall. Love! Cheese. Mozzarella. Fresh mozzarella. Those are the words that made the arrival of Tavern 1903 so exciting to me. 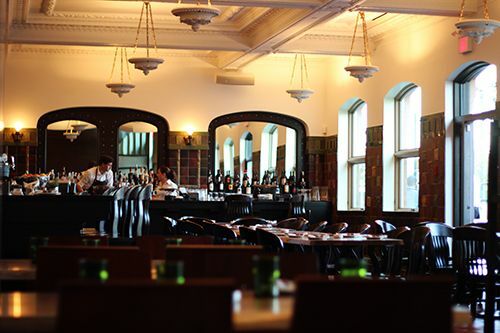 Managed by the same team as that running the Hardware Grill, Tavern 1903 is a resto-bar located within the restored Alberta Hotel - and it has lots to offer! 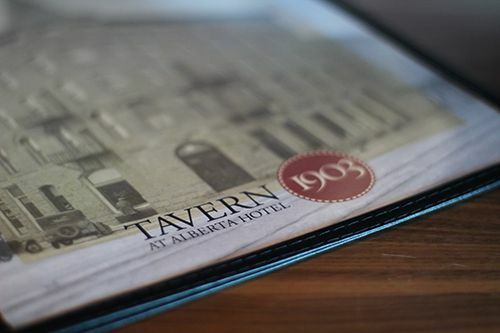 Located right along Jasper Avenue across the street from the Shaw Conference Centre, Tavern 1903 is hard to miss. As I walked up to the restaurant, it gave off the image of a great location for a post-work drink, especially since it's located in the downtown core. 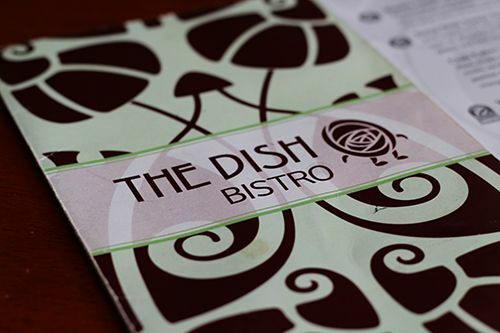 A patio is located at the front of the restaurant, furnished with comfortable, cushioned seats to sit in, kick back, and enjoy the last of summer. When you walk into the restaurant, the juxtaposition of vintage and modern immediately hits you. 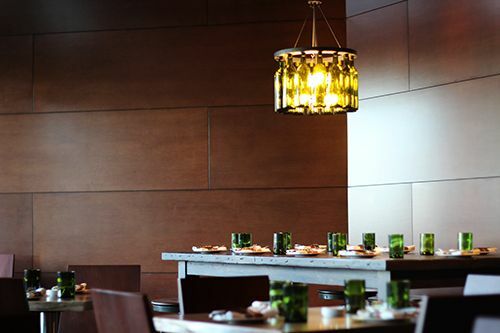 To the left is the modern restaurant, with wooden decor and wine-bottle inspired glasses. To the right? The contemporary lounge with a fully restored vintage bar. The inclusion of the bar has allowed the tavern to make cocktails a big deal - the menu celebrates classic martinis and manhattans, as well as others with a twist. Like I said earlier, the Mozarella Bar is what made me anticipate the arrival of this restaurant. Fresh mozarella made on site and combined with fresh ingredients - what's not to love? On the menu were different combinations of fior di latte (fresh with cows milk), buffalo mozarella, and burrata (milk and cream), and my friend and I chose to go with the burrata ($15): confit tomato, basil pesto, lemon. For those of you that have never tried burrata before, I urge you to give it a try! It consists of a smooth, creamy interior similar in texture to mascarpone, and it's housed inside a firmer layer of cheese. 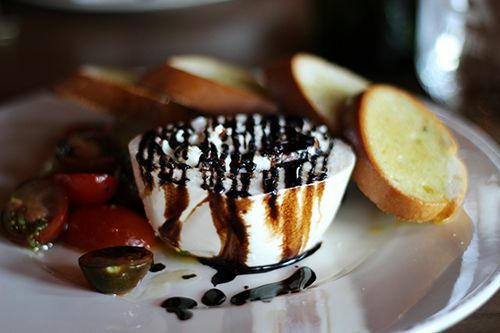 With our burrata was the tangy tomatoes and balsamic, giving the cheese its flavour. Alternatively, salt was available at the table for use with the cheese, or it could be spread on the warm crostini. The crostini had the perfect toasted exterior, while the inner portions were soft and pillowy - seriously, nothing short of amazing. 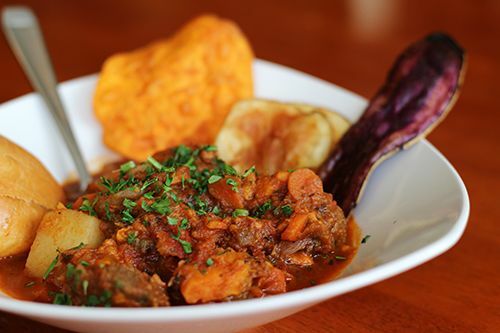 A large section of Tavern 1903's menu is dedicated to smaller plates meant to be shared at the table. 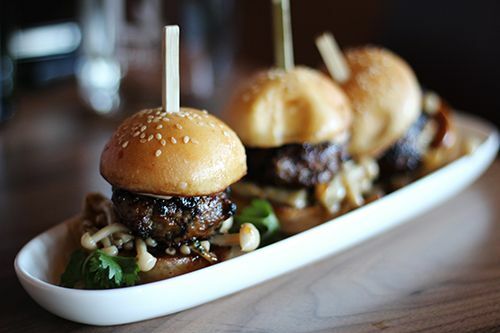 For us, we chose to try the Duck Sausage Sliders ($14): five spice aioli, shiitake mushroom relish. Three sliders showed up to the table, and looked so cute with the small mushrooms sticking out of the toasted bun. 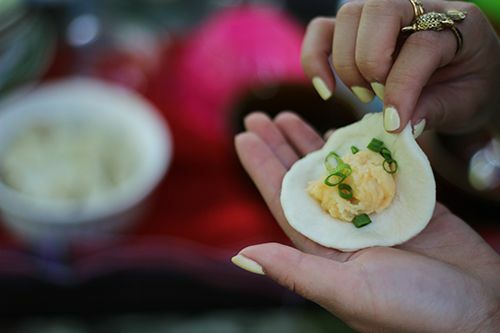 In the patty of this Asian-inspired slider was the prominent five spice flavour blended together with some sweet and sour notes. It had a great texture, was tender and juicy, but it was next to impossible to tell it was made with duck. Aside from that, the flavours worked well together and I would have them again. 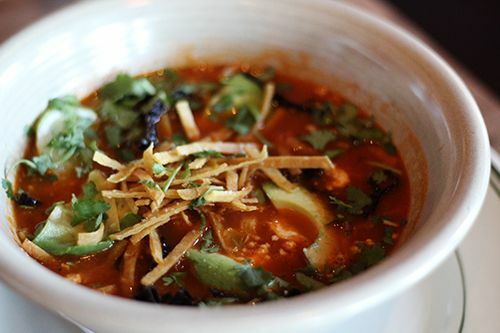 From the larger plates, my dining companion tried out the Tortilla Soup ($16) with smoked duck, Padilla chilies, avocado, goat feta, cilantro, tortilla strips, tomato broth, crema & a fresh lime wedge. It arrived still bubbling to the table and the first sip of this soup was a flavour roller coaster. There was an incredible depth to the flavour, nice heat from the chilies, and the crispy chip pieces with creamy cheese and avocado was delicious. I was a tad jealous that this soup was not mine. For myself, I felt the need to order something a little lighter considering I had the rich cheese to start with. 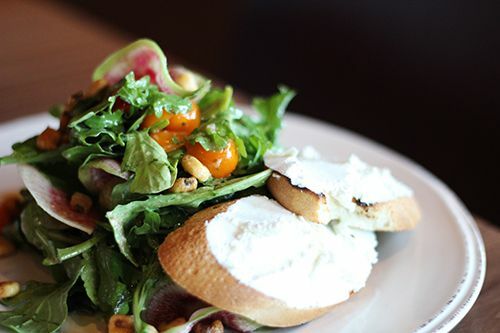 That meant having the arugula salad ($10) with heirloom tomatoes, Alley Kat Ale vinaigrette, Fairwinds Farm goat cheese toast, toasted Corn Nuts and watermelon radish. The salad was presented beautifully in a heaping pile, and I just loved the touch of pink added by the radishes. I've actually decided I want to grow these next year! Anyway, the salad was light and refreshing, and the different textures kept each bite interesting. I like my salad dressings to be savoury, and this vinaigrette was sweet, but it wasn't a huge bother for me while I was eating it. This dish also had the same bread that came with the mozzarella, and was slathered in a thick layer of goat cheese. The cheese was creamy and not too pungent, but I actually would have preferred less of it. Maybe I was out of my mind, but I had to have a cheesy ending to dinner with the Short Bread Cheesecake Parfait ($7) with buckwheat honey fruit compote. 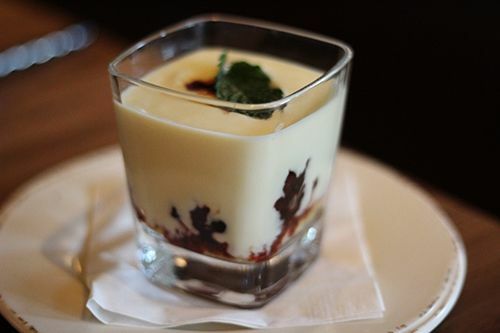 The dessert arrived to the table in a cup, liquid and jiggly like unbaked cheesecake batter. The cheesecake portion was smooth, sweet, tangy, and quite cheesy - almost too much for my palate to handle on its own. But when combined with the sweetened fruit in true parfait fashion, the flavours balanced each other out. As summer is inevitably changing into Fall, it makes me think of things that are leaving with it. One of my favourite things to do is visit the outdoors farmers markets in my city to enjoy the local festivities and see the beautiful seasonal produce. There's even food trucks on site, so what's not to love? Our markets run through the winter indoors, but without the sunshine and warm breeze, it just isn't the same. 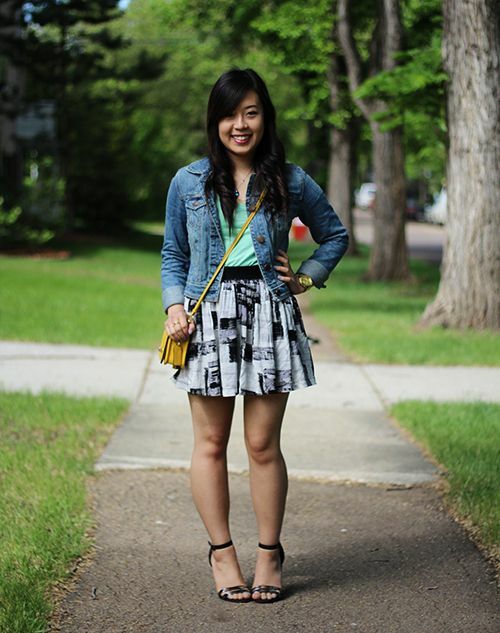 Easy outfits like this one are my go-to on Saturday morning market trips - simple, carefree, chic. Happy Monday! I'm back from a weekend away (again) - and I never thought I would return exhausted from a weekend getaway! My best friend is getting married this year, so us in the bridal party took her out for a bachelorette weekend away. So. Tired. But hey, I love weddings and am counting down the days. It's another week back at school for me and I'm hoping this one goes by quick. And with the return of school is the inevitable change of seasons - the days are getting shorter, and the mornings are getting colder. Hello, Fall. 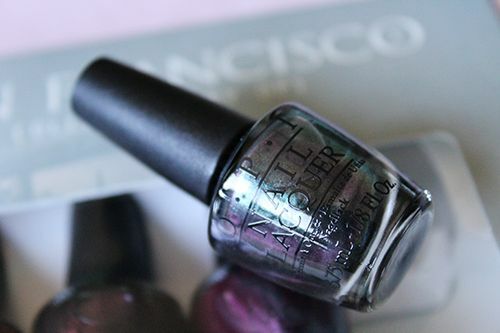 So I picked up a few shades from OPI's Fall 2013 Collection featuring the beautiful city of San Francisco. 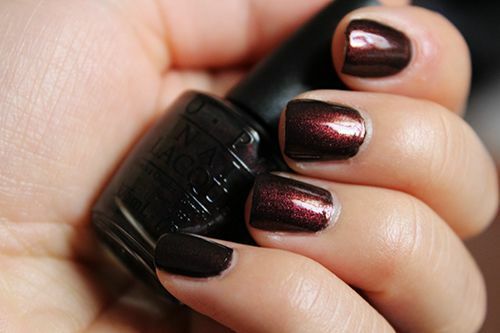 Up this week is one of my favourite fall shades - a gorgeous deep plum creme called In The Cable Car-Pool Lane. 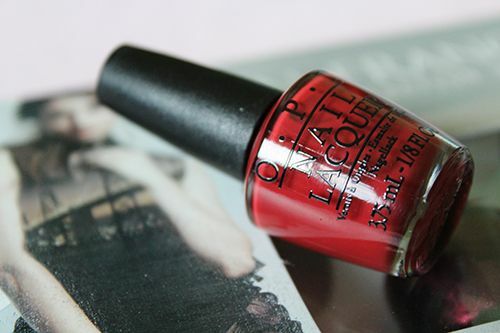 Although the colour is beautiful, I wasn't too impressed with the formula and application. I found the polish to be a little thicker than normal, so application was streaky, and the polish wouldn't level itself out. At three coats in the pictures above, I could still see streakiness and wasn't happy with the finish. The manicure lasted only 3 days before chipping, and I would attribute it to the formula. Boo. Hopefully the next polish performs better! Perogies. Who doesn't love perogies? 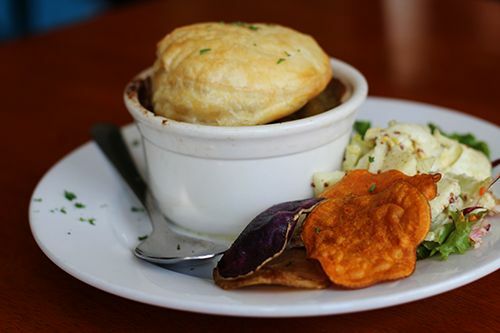 It's comfort food to the fullest, and definitely food coma material. And there's so many ways to cook and customize them that there's something for everyone. What's your favourite? 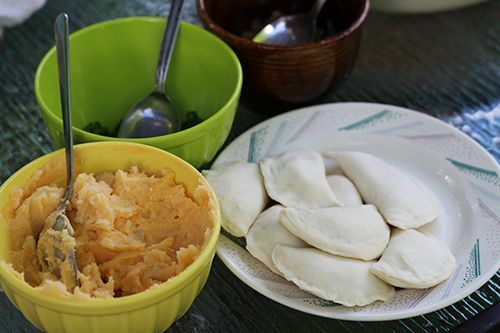 A couple months ago, I set aside an afternoon to spend with my lovely friends K, A, M & G to make perogies from scratch. Yep. It really helps when you have a friend who's grandmother is a perogy whiz and grew up learning to make them with her - one phone call was all it took for us to get the secret recipe. And now I get to share it with you! I think the thing that scares people the most about making perogies is the dough. Well, at least it was what I was most unsure about. Like, what goes in the dough? Fillings are easy - mash up some potatoes, add your favourite fixins and voila, wrap it in the dough and cook it up. But surprisingly, this dough has two ingredients. Literally. Flour and sour cream mixed together to achieve a doughy consistency, rolled out and cut to the perfect size. And once it's cooked up, it tastes amazing! With a little prep work and elbow grease, you can make your perogies in the afternoon and serve them up for dinner. The funnest part in the whole process is getting the hang of filling the dough and shaping the perogies. 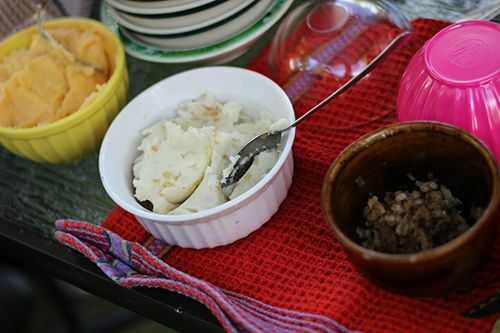 For the filling, we had mashed up potatoes as our base, and added different components to change things up. 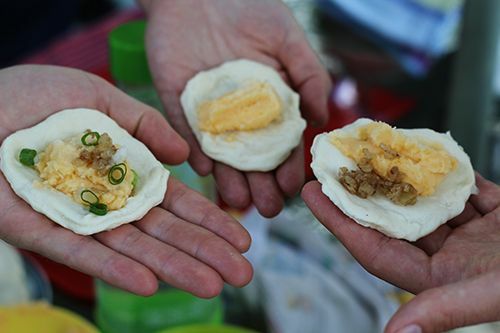 One was a cheesy potato filling, while another had green onions, and others yet had some diced up caramelized onions. Want more ideas? Try bacon or mushrooms - whatever makes you happy! 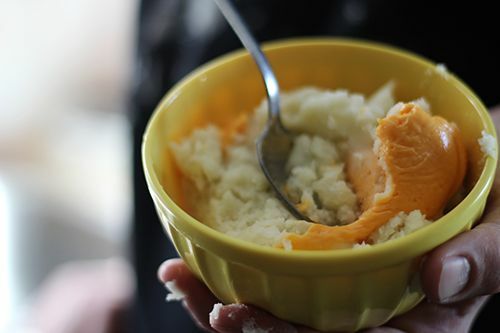 Pro tip: K's grandmother suggested using Cheez Whiz to make potatoes cheesy, as it is much easier to incorporate. But I'm sure if you cooked up a quick cheese sauce with your favourite cheese it would be the same. The bunch of us together had so much fun making the perogies. All of ours looked different from one another, and it was fun making an activity out of it. G went and did some "perogy inception" - he put a small perogy into a larger one. Oh, boys. Once all the perogies were folded up and ready to cook, we boiled them, hoping they wouldn't burst open in the cooking process. 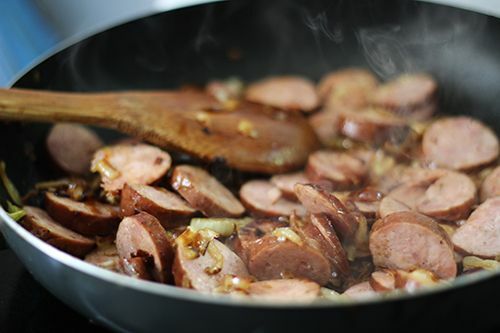 Together we fried up some bacon, sausages, and onions - the house smelled amazing! Buns, perogies, sausages, bacon, borscht, and sour cream galore - we had a feast to serve at least 10 people. The process was easy and straightforward enough that I could totally do it again if I had the craving. Homecooked is always the best, as you're able to control what you are making and eating, and you're able to tailor things to your dietary needs. When K grew up, her grandmother also made dessert perogies. This was something completely new to me, and I had no idea what we would be putting in them. 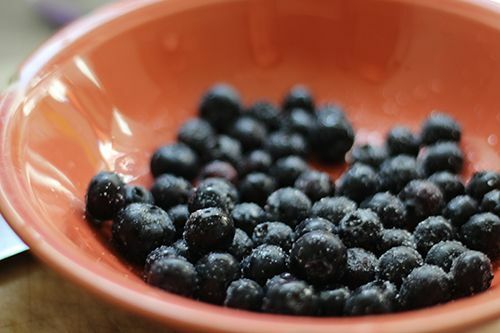 For the afternoon, we decided to fill our sweet perogies with blueberries and strawberries tossed with a bit of sugar. Cooked up and served with yogurt, they were delicious! I can only imagine filling them with other fun things... like chocolate.. or salted caramel.. oh man. 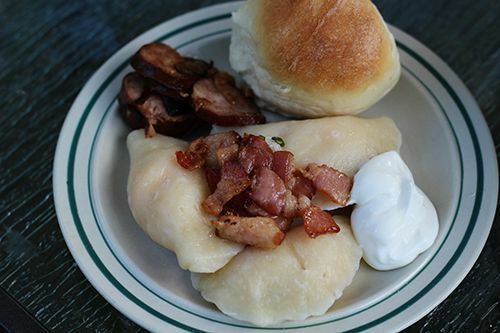 So grab some friends and have a perogy feast! 1. While stirring the sour cream, add flour 1/4 cup at a time to achieve a doughy consistency (you will have to watch carefully and adjust the flour). 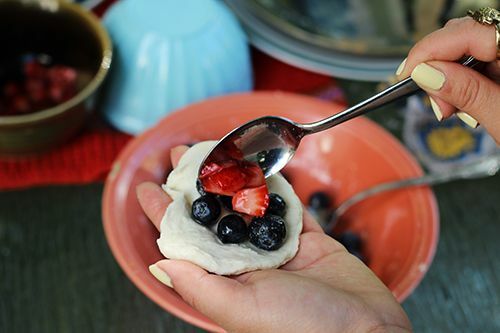 When the dough is ready, it will be barely sticky to the touch and stretchy. Knead slightly to ensure everything is thoroughly incorporated, and place in the fridge for 30-45 minutes (longer is not a problem). 2. Prepare your fillings for perogies. 3. 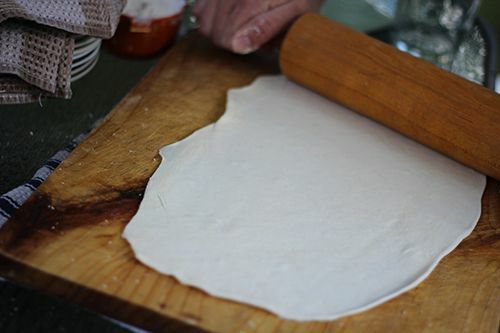 After refrigerating, roll out the dough to a thickness of 0.5cm. The dough should not stick to the surface it is being rolled out on. 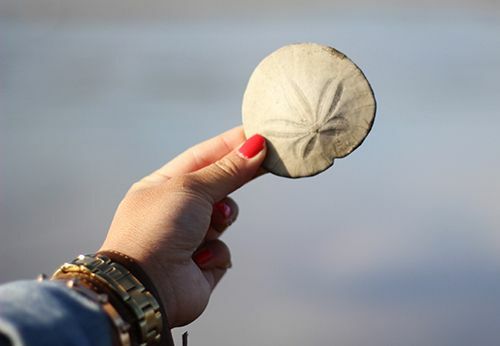 Cut with a cookie cutter or a cup with an approximate diameter of 6cm. 4. In your hands, work the dough slightly, thinning out the centre and edges. Place a dallop of filling into the centre, then fold the dough in half, pressing tightly on the edges to seal your perogy. 5. Bring to boil a pot of salted water, and drop in the perogies to cook. The perogies will float when they are ready to eat. 6. 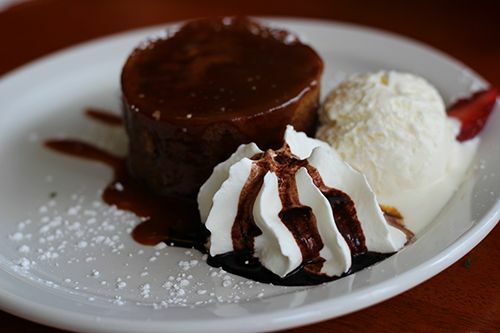 Serve them up the way you like & enjoy! Super easy, right? 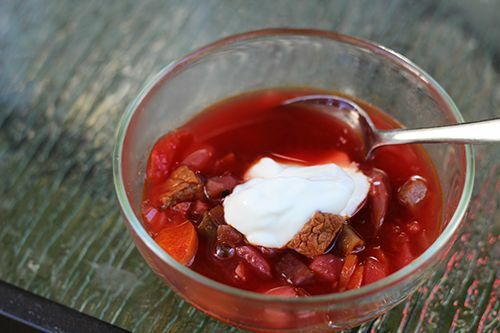 Let me know in the comments below if you try this recipe out!